The camera is installed inside the “hot” area, and cables carry the 3D color picture signal to a viewing console located safely outside the dangerous area behind thick shielding walls. The viewer watches the picture on the TV screen while operating remote manipulators which position and shift reactor components in the radioactive area. This equipment was designed for use by General Electric’s Aircraft Nuclear Propulsion Department at the Atomic Energy Commission’s test site at Idaho Falls, Idaho. How It Was Developed. To give the illusion of depth to a picture reproduced on a flat surface, two images are necessary. One is a view of the reproduced scene as it would be seen with the left eye, while the other is the view as seen with the right eye. Each eye must be able to see only the image that is intended for it. There are several ways of accomplishing this. In the old-fashioned stereoscope and in hand-viewers, two complete pictures are used, with separate optical paths for each eye. Theoretically, such a system could be used for 3D television. Two complete TV channels would be required, with each channel having its own camera, transmitter and receiver, and the viewer would have to use a special optical device for viewing the separate screens. But this type of system would be cumbersome and generally impractical. A somewhat different system was developed and used in prewar motion pictures. A red image (for one eye) and a blue image (for the other eye) were projected simultaneously onto a single motion picture screen. The observer was supplied with a special viewer which had red and blue filters; it was held in front of the eyes like a pair of spectacles and permitted one eye to see only the blue image and the other to see only the red image. 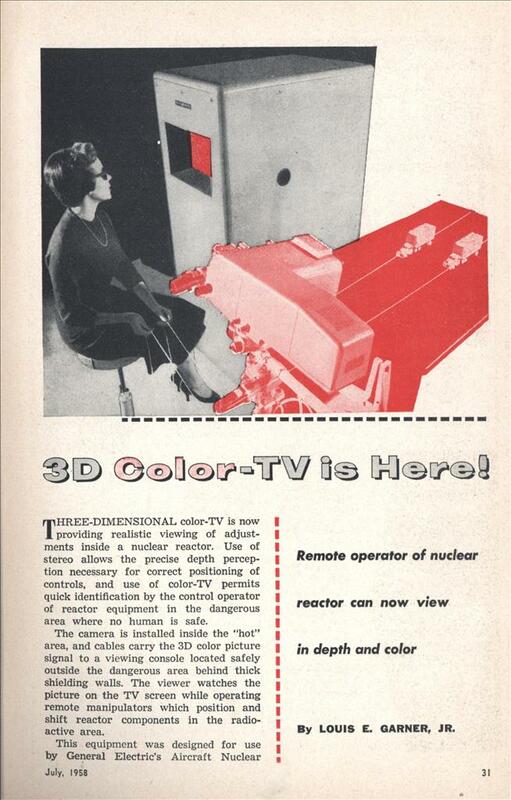 In postwar motion pictures, this early system was modified to permit the showing of full-color 3D films. The picture was reproduced using polarized light and the observer was supplied with a special pair of spectacles having properly oriented polarizing filters. If the vibration of light is restricted to a single plane—such as the vertical—the light is said to be polarised. Such polarization may be achieved by means of simple optical filters. The color of light depends upon its frequency of vibration and not upon its plane of polarization. Thus, polarized light does not lose its color characteristics. Once polarized, the light can pass through another polarizing filter only if the second filter is oriented to transmit light of the same polarization. In other words, if light is polarized in the vertical plane, it will not pass through a polarizing filter oriented to transmit light polarized in the horizontal plane, and vice-versa. In practice, the image intended for one eye is vertically polarized and the image intended for the other eye is horizontally polarized. The special viewer used by the observer is equipped with one filter for each eye, which sees only the image meant for it, with each image retaining the full color of the original scene. It is this system, used in 3D motion pictures, that has been adapted to 3D color television. How It Operates. A functional diagram of the basic system is shown in Fig. 1. The three components—camera, transmitter and receiver—are connected by multi-conductor cables. The camera is equipped with a dual optical system having a perspective similar to that of two eyes, and the scene viewed through the two lenses is transmitted through a rotating shutter to a special color-TV camera tube. Instead of presenting the image to two sensitive surfaces, as in the human eye, the 3D TV system presents the two images to a single sensitive surface (the camera tube) on a time-sharing basis, depending on the speed of the rotating shutter. 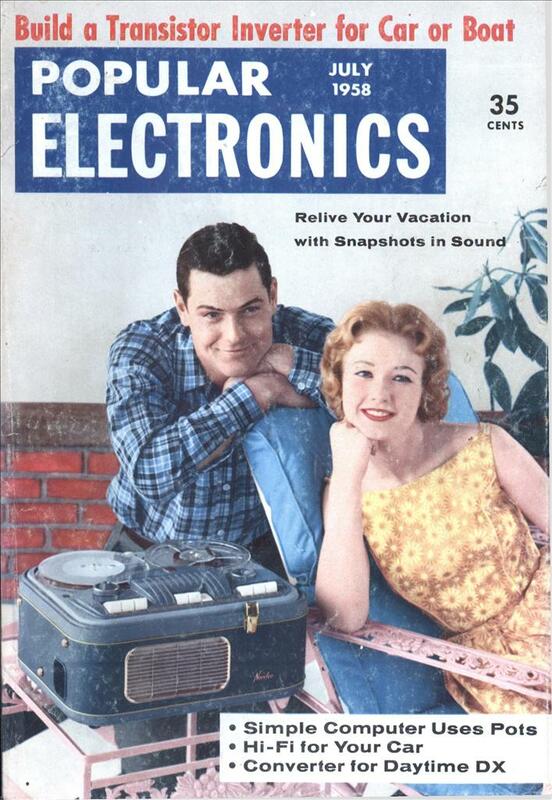 The frequency of the time-sharing is at the picture rate of the television system— in the G.E. equipment, the rate is 90 pictures per second. Half of these pictures (or frames) are meant for each eye alternately. Thus, the frame-rate for an individual eye is 45 pictures per second. Except for the frame rate and the use of a rotating shutter and dual optical system, the circuitry of the 3D color camera is quite similar to that of a conventional color-TV camera. It incorporates video amplifiers, synchronizing circuits, clippers, and related electronic circuitry. A single composite picture signal is obtained from the transmitter. At the receiver, a full-color image is formed on the screen of a single-color cathode-ray tube. Polarizing filters are passed in front of the receiving tube’s screen, with alternate segments having their axes of polarization at right angles to each other. These polarizing filters may be rotated in front of the screen by means of a disc, as in early color-TV experiments, or by means of a drum of alternate filter segments, as shown in Fig. 2. The motor driving the disc (or drum) is synchronized with the television frame rate so that alternate picture frames are polarized vertically and horizontally. The viewer wears polarizing spectacles and sees only the left-hand picture images with his left eye and the right-hand pictures with his right eye as alternate pictures are flashed on the screen and as alternate filter sections move before the cathode-ray tube. The two images, combined by the brain, give the illusion of depth to the reproduced composite picture. How It Will Be Used. Although not yet feasible for the living room, this closed-circuit 3D color-TV system may have many industrial and scientific applications. For example, such a system might well be used to observe nuclear power plant operation in the giant nuclear-powered rockets of the future. The crew of such a rocket will have to be located behind adequate shielding outside the reactor’s area, yet will need to see the control rods and other control components. Other applications may include the observation of submarine life at great ocean depths, the exploration of the interior of active volcanoes or of the depths of deep mines and caverns, and the study of natural phenomena in remote or dangerous locations. Wait – NFL football wasn’t the first application after all? Amazing.